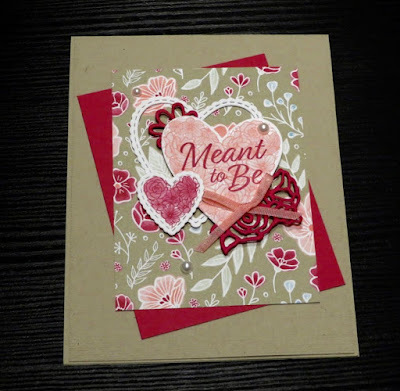 Karina's Kreations: Stampin'Up Meant to be! If you like to make Valentine's Day, Wedding or Anniversary cards, you will want this brand new stamp set from Stampin'Up. It is called Meant To Be. It can be purchase by itself or as a bundle with the coordinating Be Mine Stitched Framelit Dies. This set also coordinated with the Forever Lovely Bundle. This is a swap card I received from Leena Girsa. Isn't it a pretty card? 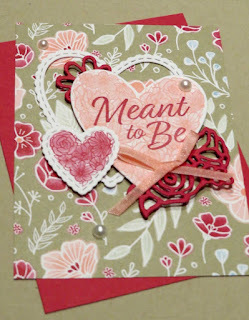 I love all the elements she used on her card along with the All My love Deisgenr Series Paper. If you purchase on of these bundles, you will qualify for a FREE sale-a-bration item. Here's the supply list for this card. To place an order, please click on one of the pictures.